The House on Wednesday voted 240-188 to approve the first of four appropriations bills in Democrats’ latest effort to end a partial government shutdown, now in its 19th day. 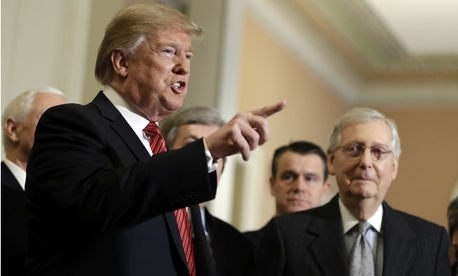 But although some Senate Republicans appeared to waver on keeping portions of the government closed over President Trump’s demands for $5.7 billion in funding for a wall along the U.S.-Mexico border, Wednesday provided little in the way of progress toward a solution. The bill (H.R. 264) approved by the House provides funding for federal services and general government agencies, including the Internal Revenue Service and Treasury Department, at levels approved by the Senate last year. The bill includes a 1.9 percent pay increase for civilian federal employees, overriding Trump’s pay 2019 freeze, and reinstates a pay freeze that has been in place since 2013 for the vice president, Cabinet-level officials and nearly 1,000 other political appointees. The Office of Personnel Management last week issued guidance delaying implementation of a roughly 10 percent raise for political officials, citing the potential for Congress to revive the freeze in its funding legislation. The Office of Management and Budget on Wednesday announced that the White House opposes the House-passed bill, along with three other appropriations bills the chamber plans to consider, saying the administration would only support a single bill to reopen the government and that includes border wall funding. In the Senate, some Republicans like Sens. Lisa Murkowski, R-Alaska; Susan Collins, R-Maine; and Marco Rubio, R-Fla., have become publicly critical of the president’s strategy. But Majority Leader Mitch McConnell has offered no indication he will bring up any of the House’s funding bills for a vote. A spokesman for House Speaker Nancy Pelosi said Trump demanded funding for the wall, not border security. And Senate Minority Leader Chuck Schumer said the president slammed his fists on the table—something Republicans dispute.